Mountain lions are incredible hunters, silently stalking their prey in the cover of dusk or darkness. They are completely carnivorous, which can range from deer to elk to porcupines. Mountain lions hunt for survival, not for sport. If they can't finish an entire kill in one meal, they'll cover it with leaves and brush then come back to it later. 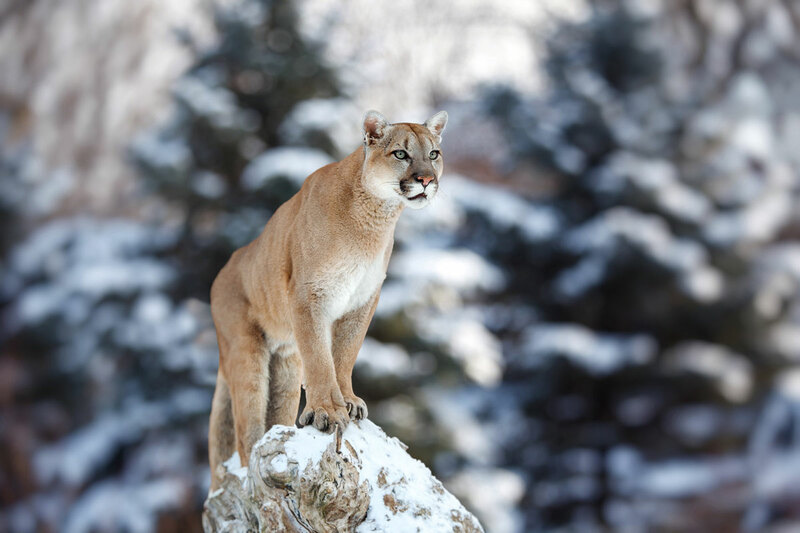 Mountain Lions are solitary and territorial. Please be aware that mountain lions have occasionally attacked humans as well?especially young children. If you do encounter a mountain lion, your best defense is to make sure you don't act like food. Yell, flap your coat, and try to make yourself look large and menacing. This will spook the cat and convince it to look for an easier meal elsewhere (Please note: DO NOT attempt this tactic with bears). Avoid instinctively running, as this will make you seem like their typical prey. While hiking, keep careful watch, and keep your children close to you.